Joe Schoenebeck, Laboratory Manager (NAS) and Mark Sauter, Instructional Specialist (AND, Woodshop) found new uses for old physics lab equipment in the art studio at UW-Green Bay. 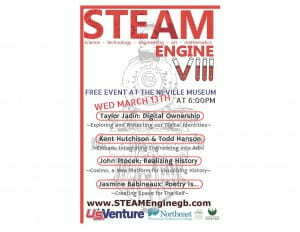 The STEAM Engine event will be held at the Neville Museum on March 13th at 6:00pm. 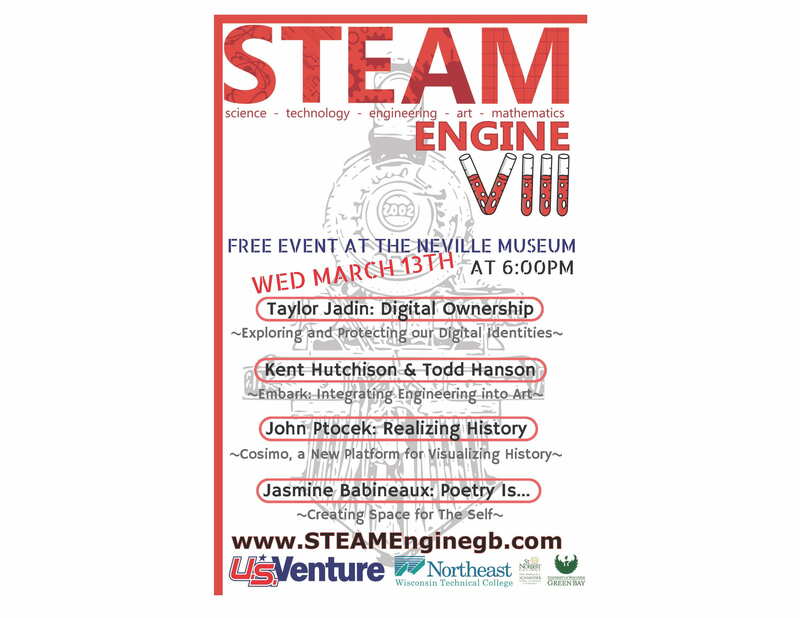 This event will feature speakers centering on topics of science, technology, engineering, arts, and mathematics. The evening will include speaker presentations, a question and answer discussion, and a social networking hour. It will be an excellent opportunity to gain new knowledge and to take part in community discussion. Click on the links below to find out more information. On March 27th from 10:00am to 5:00pm, Wisconsin Conservation Voters will be holding a Conservation Lobby Day at the Monona Terrace in Madison. This event is an excellent opportunity for voters to meet with State Senators and Representatives to talk about conservation issues. Discussion will center on specific topics regarding drinking water contaminants, saving public lands, and investing in clean energy. 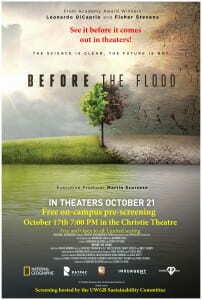 The event is free to attend and lunch will be provided. In order to help diminish carbon emissions, a bus will be available with various pick-up locations. 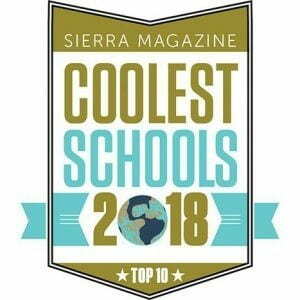 The annual Sierra Club’s Cool Schools Ranking recognizes schools on their sustainability and environmental initiative. The Sierra Club evaluates schools on a variety of aspects including school curriculum, campus engagement, and research and innovation. Among the hundreds of schools listed, UW-Green Bay ranked 239th. 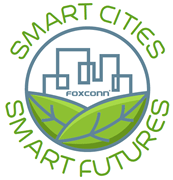 The Smart Futures Competition sponsored by Foxconn will award up to $1 million in prizes to students and staff at Wisconsin universities for new smart city ideas. The competition is designed to encourage the development of smart technology and focuses on connecting communities throughout Wisconsin. The first round of submissions were accepted starting on October 1, 2018, and more submission rounds will be available over the next three years. Attention will be given to smart city technology, such as ideas regarding smart homes, smart energy, and management of resources. The competition’s first round closed on October 31, 2018, and over 300 submissions were received. After evaluation by total of 50 judges, including the director of EMBI, Foxconn will announce the first round prize winners in December. The second round of submissions will open mid-December and close at the end of January. UW-Green Bay students and staff are eligible to participate and should be encouraged to take part in this excellent opportunity. With a solid effort from the UW-Green Bay Sustainability Committee, UW-Green Bay is again seeing STARS thanks to a newly confirmed environmental rating of SILVER from a program that measures and encourages sustainability in all aspects of higher education. 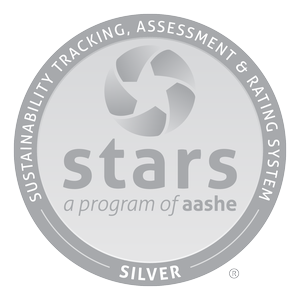 UW-Green Bay has participated in the Association for Advancement of Sustainability in Higher Education’s (AASHE) Sustainability Tracking, Assessment and Rating System™ (STARS) which measures and encourages sustainability in all aspects of higher education. This is a voluntary evaluation process completed every three years in which colleges and universities review their sustainability efforts against the STARS framework. Provide a framework for understanding sustainability in all sectors of higher education. Enable meaningful comparisons over time and across institutions using a common set of measurements developed with broad participation from the campus sustainability community. Create incentives for continual improvement toward sustainability. Facilitate information sharing about higher education sustainability practices and performance. Build a stronger, more diverse campus sustainability community. This framework assigns various levels of credit to topic areas and based on the number of credits accrued, a school achieves a reported bronze, silver, gold or platinum level. 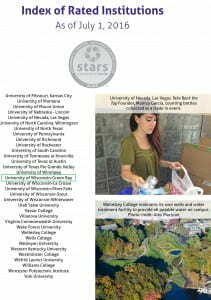 UW-Green Bay’s Sustainability Committee completed its initial STARS review in 2011 and achieved a silver level. In November 2017, UW-Green Bay once again earned a silver level ranking; the third time in a row. This ranking will be used by organizations such as Princeton Review and the Sierra Club to promote the most environmentally responsible colleges in the U.S., letting students know we are Eco U™. For more information about the STARS program and to view UW-Green Bay’s rating: UW-Green Bay STARS Report. The 2016 Sustainable Campus Index (SCI) recognizes top-performing colleges and universities in 17 distinct aspects of sustainability, as measured by the Sustainability Tracking, Assessment & Rating System (STARS). Getting ready for college can seem overwhelming; there are books to buy, roommates to meet, and, of course, a new place to move into. Ask any college student, and they’ll tell you there’s a lot less space in that new dorm room than there was at mom and dad’s place. Realizing you’ll have to downsize before you move can make packing for college a bit of a challenge. On the bright side of this challenge, it’s a great opportunity to recycle, reuse or donate everything you can’t bring with you. Before you begin packing, take a look around your bedroom. What doesn’t need to be packed? I can guarantee you that your old high school papers won’t do you much good in college (and no, you can’t reuse those for your college assignments). Old papers, books and folders are all recyclable in your curbside bin. Even that “vintage” flip phone and mp3 player can be recycled. The Brown County Household Hazardous Waste facility accepts all types of electronics. If your closet is busting at the seams, it’s time to downsize. There are a lot of places that will take your unwanted clothing if your friends or siblings won’t be caught dead in those styles. The Salvation Army Thrift Store, Goodwill, St. Vincent De Paul and several other nonprofits will gladly accept your clothing donations. Once you’ve gotten rid of some of the clutter, it’s time to actually start packing. You basically have two options for your packing containers: cardboard or plastic. The choice is yours, but there’s a smart way to use each. For cardboard boxes, check your local grocery store or department store for used cardboard boxes. Stores usually have an overabundance, and most of them are in good condition. It saves you money since you don’t have to buy new cardboard boxes, and it’s a great way to reduce waste. Once you unpack your cardboard boxes, you could pass them onto to someone else who’s moving. If no one wants them, just recycle them at the Recycling Transfer Station here in Brown County. If you choose plastic, buy quality totes that will last a long time. They’ll come in handy the next time you have to move, and they can be used to store things indefinitely since they’re stackable and keep your items safe and dry. When you’re unpacked and moved in, your recycling challenge doesn’t have to be over. It’s actually not as hard as it sounds to be intentional about recycling in college. At the very least, most colleges across America encourage their students to recycle by supplying their on-campus housing with recycle bins. Colleges like Pepperdine University set an amazing example, with only 22 percent of their waste produced going to landfill and the other 78 percent recycled. If you find your college doesn’t have a recycling program or any sustainability initiatives yet, you can still get involved. RecycleMania is a friendly competition and benchmarking tool for college and university recycling programs to promote waste reduction activities to their campus communities. Keep America Beautiful is another great resource to help you continue recycling and stay green in college. Mark Walter is the business manager for Brown County Port & Resource Recovery and a supporter of the Environmental Management and Business Institute’s (EMBI) sustainability internship program. 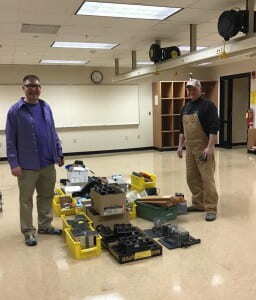 During the Move-Out Donation program at UW-Green Bay, about 6,000 lbs of material were donated for a good cause. Goods varied from food, clothes, books, and small furniture to other items typically found in a dorm room. Thanks to the cooperation with St. Vincent de Paul, students at UW-Green Bay could drop off the goods in their residence halls, from where all donations were picked up in bulk at the end of the spring term. Among the donated goods were about 35 cubic feet of non-perishable food packages. That is more than the total volume of a large double-door household fridge. All of these items went to help clients at “Paul’s Pantry”, a community initiative founded in 1984 to help families in need fight hunger. Both the University and St. Vincent de Paul hope to be offering the same program again in the 2015-16 academic year. Meanwhile, all those who will be coming back to campus in the fall are invited to take a look at our suggestions for Move-In Day at www.uwgb.edu/sustainability/tools/moving.asp. Photo, quotes and citations courtesy of St. Vincent de Paul.